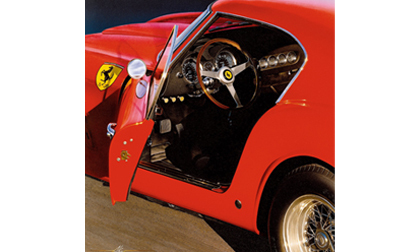 PEBBLE BEACH, Calif. – August 16, 2018 – The 35th annual Automotive Fine Arts Society (AFAS) exhibit will include a host of international guest artists from Asia and Europe during the Pebble Beach Concours d’Elegance. Sponsored once again by the Lincoln Motor Company, an automaker formed by the early convergence of automotive design and artistic intent, the AFAS show will take place on Sunday, August 26, beside the 18th fairway of Pebble Beach Golf Links. The AFAS exhibit will display stunning artwork by some of the world’s most talented artists. In India, a country of a billion people with a middle class expanding exponentially, appreciation of the automotive form grows, while vehicular transport expands its accessibility. The artwork of Vidita Singh is a testament to India’s automotive history and traditions, and one she communicates through both her artistic ability and inborn passion. Vidita’s work has been featured on television shows like BBC’s ‘Wheels’ and NDTV India’s ‘Raftaar’. She has also been featured in automotive and lifestyle magazines such as Hello Magazine India, BBC Top Gear, Auto India, Femina India, Motoring Overdrive and Auto Motor and Sport. Given that cars – and the corresponding culture – began in Germany, it should be no surprise that Germany is represented on the AFAS guest list. Growing up in Bavaria, Hendrik Muller’s career path has included graphic design, printing and photography before embarking on a full-time art career. In that career the artist has done more than forty covers of BMW Magazine, numerous illustrations for BMW exhibits in Tokyo and Turin, and much of the design work for exhibits at both Nurburgring and Detroit. Hendrik’s work is part of extensive collections throughout the U.S., Europe, Japan and Russia. A 1992 graduate of Pasadena’s Art Center College of Design, Yahn Janou’s art has focused on racing cars and racing scenes since 1993. And while several AFAS members produce automotive portraiture that’s extremely realistic, Yahn prefers to skew much of his work toward abstraction. That preference, as Yahn sees it, communicates the emotion of the moment rather than simply the image. And given that Yahn’s subject matter is invariably automotive competition, his artwork never lacks for emotion. Yahn exhibits regularly both in Europe and in the United States at major international events like Pebble Beach, Goodwood, Cavallino Classic, Essen and Rétromobile. Growing up in postwar Japan, Toshiharu Inagaki witnessed his country’s growth from what was largely agrarian to the Pacific’s mighty exporter of consumer goods. Of course, much of that export business was automotive – and it caught Inagaki’s eye (and imagination) from a very early age. Inagaki’s work is highly stylized and speaks clearly to the emotion that sits within the sheetmetal and under the hood. Recognized as one of the finest automotive illustrators to come from Japan, Makoto Ouchi is a true master of the airbrush. After graduating from Hosei University, Ouichi moved to Munich in order to learn more about perspective, returning to Japan in 1978. Pursuing a career in technical illustration, Makoto has worked for both Subaru and Yamaha Corporation. He has exhibited at Pebble Beach since 2015. Honda, Mitsubishi, and Ford, as well as tiremakers Dunlop and Bridgestone. He currently lives and works in Japan. In addition to the international artists, AFAS will host a pair of Americans. Steve Macy’s love affair with automobiles began at a very early age…while holding a wrench; later he fell in love with the form. Attending the University of Illinois and the American Academy of Art, Macy obtained his formal training in both art and architecture. And while his career path centered on architectural illustration, his passion has been automotive art. The discipline required in architectural illustration is easily seen in Macy’s automotive work, which projects a photorealistic style. The award-winning work has been shown in both invitational and juried competitions throughout the country, seen in varied publications and has been enjoyed by private collections throughout the world. Born in Raleigh, North Carolina, Dan McCrary’s earliest memories are of old Ford flatheads – unmuffled – racing around the quarter-mile oval at the Raleigh Speedway. That was then, automotive art is now, and in between was music, some college and the Army. With water color as his preferred medium, McCrary has sold and exhibited his work at car shows and Concours throughout the U.S. He continues to reside in Charlotte, North Carolina.